Double Feature! M. J. Scott’s Latest! “Just Call Me Mom” takes a generational look at the critical role that love plays in the relationships among children, mothers and grandmothers. Author Scott draws from her long career as an educator working with children and their parents and grandparents to capture unconditional love in her word canvas so that the reader can be reminded about the healing power of love. For over thirty years, M. J. Scott has worn her beloved purple bathrobe, which has born witness to the countless dramas, achievements and social events of her successful lifetime. Once she had the thought, “If this robe could talk!”, she realized that her hilarious conversations with her uniquely talented bathrobe would serve to lighten life for her readers. And so “The Purple Bathrobe” was born! A wily and devoted observer of her life, the bathrobe likes to question her actions so that the author can confirm the wisdom of the daily choices she makes. The conversations are humorous and affectionate, and the reader also is likely to learn a thing or two from this veteran, frequently-worn garment! Click Here to Purchase Double Feature! in Print for $10.00: Double Feature in Print Note: when you buy the print book, you can also get the e-book free! M. J. Scott and Daniel Wetta Co-Author Sport’s Alien Fantasy! Sport has memories of multiple births. She remembers flights through space and vistas of vibrant silo cities in colorful, faraway lands. People she invents in imagination come alive. Her parents and educators think she’s crazy. Her 1986 road trip is disastrous, and Sport, the cheerful school teacher, is refused help again and again. People gossip that she ages too slowly. Her admirers have questions to which Sport has no answers. But a child savant helps her understand her origins and destiny in Sport’s Alien Fantasy! Sport’s Alien Fantasy! Is Sport an alien or angel? Sport’s Alien Fantasy was first written by M. J. Scott in rough draft form in 1986, shortly after the horrifying explosion of the Challenger spacecraft in which the astronauts on board perished, including beloved school teacher, Christa McAuliffe. 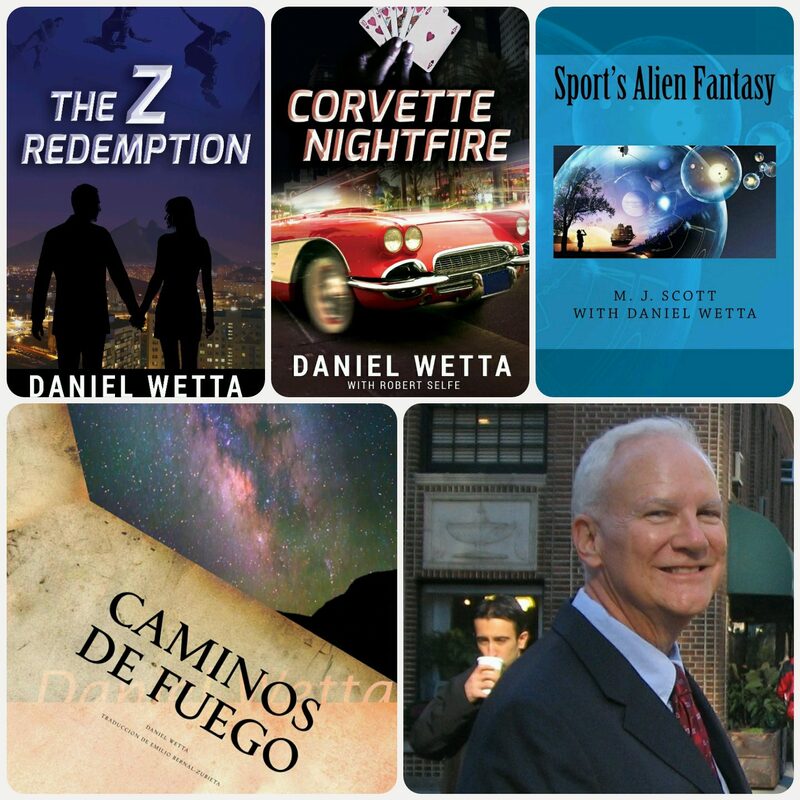 Editor and publisher, Daniel Wetta, recognized the extraordinary story within the draft novel’s pages. Scott and Wetta then agreed to corroborate on a re-writing to submit to the Kindle Scout campaign. There, the novel garnered nearly a thousand nominations and spent time on the “Hot and Trending” list. A good part of the story takes place in the 1980s, when today’s digital and international connectivity began to make its impact on man’s daily life on earth. The authors believe that the global connections and disconnections prevalent among human relationships today can be understood in the symbolism of the Challenger explosion. In the novel, Sport impels the reader to feel the sadness that fearful unwillingness to help others can inflict upon those in dire need, but she also thrills us with the joy of self-realization. Sport finds a new beginning and a new ending. She lives to be, perhaps, the extra-terrestrial being who can teach us what we need to know to master living and loving one another on our stressed planet. To Learn More about M. J. Scott and her other books, Visit her Webpage and Author Central Page on Amazon!